As a new member of Griffin series by GeekVape, Griffin 25 Mini has a smaller e-juice capacity of 3ml and improved velocity structure. It comes with both top and bottom airflow set. Compared with Griffin 25 RTA, Griffin 25 Mini has a smaller e-juice capacity of 3ml and improved velocity structure. It comes with both top and bottom airflow set, you can choose to control both airflow or just bottom airflow. It provides 2 pieces of different drip tips for your daily use which will give you different vapor experience. With 25mm overall diameter, it fits most big box mod with 510 Thread. Black ans SS colors. • It comes with 510 thread, fits most 510 thread MODs. Atomizador de gran calidad, las dos entradas regulables hacen que el flujo de aire sea realmente bueno, sabor bueno tambien y vaporadas tan grandes como quieras. Envio rapido, 20 dias a España. Хороший бак, вкус передает классно.единственное в комплектации нет койлов . 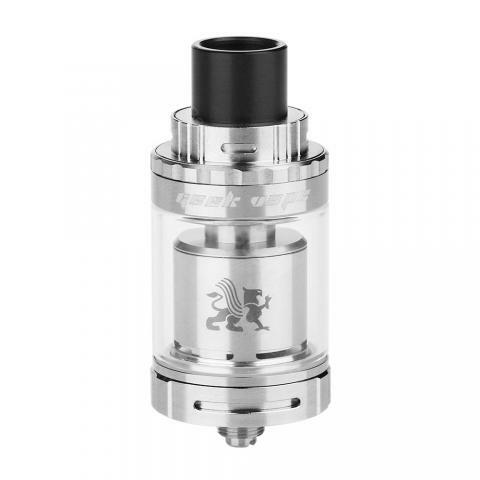 GeekVape Griffin, sehr schneller Versand, schönes, komplettes Starterset, bin sehr zufrieden. Geschmack der Liquid's sind sehr gut. The Griffin 25 Mini is slightly smaller than I had expected. It works as good as the original Griffin.